Aloft Hotel, New Orleans, Louisiana: This 29-story hotel in downtown New Orleans was in serious need of an exterior restoration. A substantial portion of the job was masonry restoration including pressure washing, tuck pointing deteriorated mortar, replacing window opening lintels, and infilling windows with new CMU (concrete masonry units) and salvaged glazed and velour face brick. Other renovation work included installing liquid applied flashing around existing window openings, cutting out and re-caulking brick expansion joints, caulking around new windows installed in existing openings, and installing urethane traffic coating at an existing parking garage below the hotel and chemical resistant traffic coating at the pool plaza deck surrounded by waterproofed planters on the eleventh level of a 30-story building. 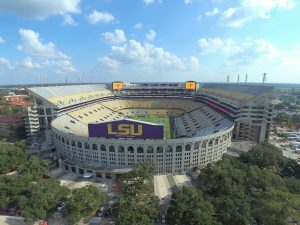 LSU Tiger Stadium, Baton Rouge, Louisiana: This football stadium in rainy Baton Rouge was having problems with water leaks in many areas. To fix these problems, Kemco Inc. Specialty Contractors installed new expansion joints, hot-applied waterproofing, and urethane pedestrian traffic coatings at the vomitory and seating areas. We also cutout and re-caulked precast concrete joints. Other renovations included installing epoxy sloping compound to eliminate “ponding” at the corridors and replacing elastomeric wall coatings on vertical walls.